Perhaps you know something about forex trading, binary options, commodity trading, and even cryptocurrencies. But are you familiar with exchange-traded funds(ETFs)? IQ Option has a grand range of financial assets you can choose from. Binary options, digital options, FX options, forex pairs, commodity CFDs, stock CFDs, equity index CFDs, cryptocurrency CFDs… and also a wide selection of ETFs. 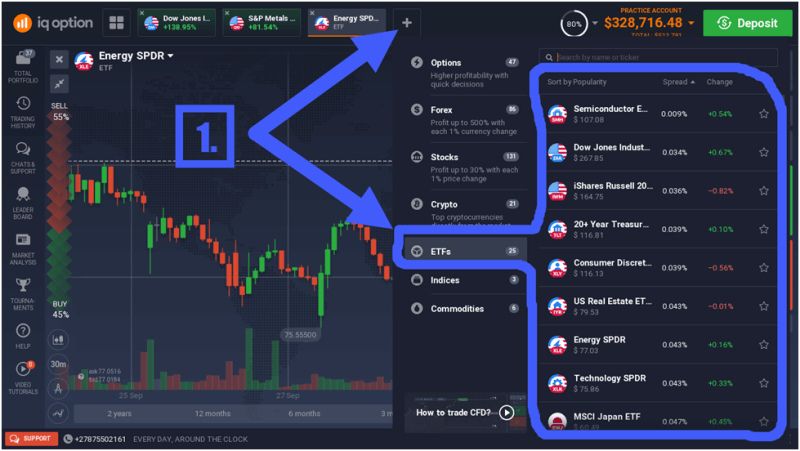 Join us for a walk through IQ Option’s award-winning trading platform, and how to trade a wide range of ETFs with this top-notch broker. ETFs are investment funds which can be traded on stock exchanges, much like individual stocks are traded. A single ETF can hold numerous assets like a selection of commodities, interest rate instruments, bonds, currencies, stocks, etc. An ETF is basically just a basket of securities that can be traded as one single financial instrument. Shares of ETFs, unlike the shares of mutual funds, can be bought at any time during trading hours because the net asset value(NAV) is calculated throughout the day. ETFs are passively (and inexpensively) managed and are not intended to outperform a certain benchmark index or basket of securities. The objective is to track an index or basket of securities. IQ Option’s ETF instruments are actually contracts for difference (CFDs) for which different ETFs are the underlying financial instruments. These ETF CFDs can be bought (long positions) or sold (short positions). 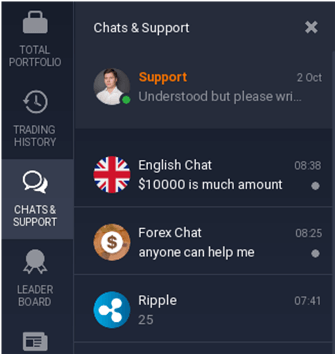 IQ Option’s multi-asset trading platform can be accessed via desktop, web, iOS(mobile), and Android(mobile) applications. 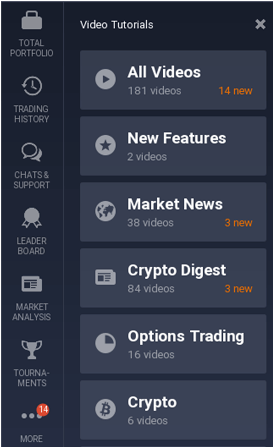 This makes ETF trading really convenient because not only can you trade it with a pc, but also with your favourite mobile device. 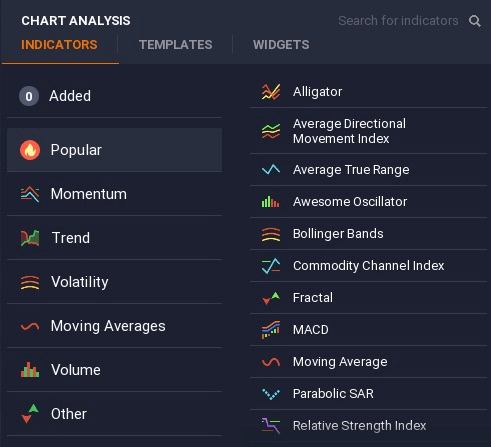 IQ Option has 25 different ETFs available on its trading platform, although more ETF instruments are likely to be added soon. 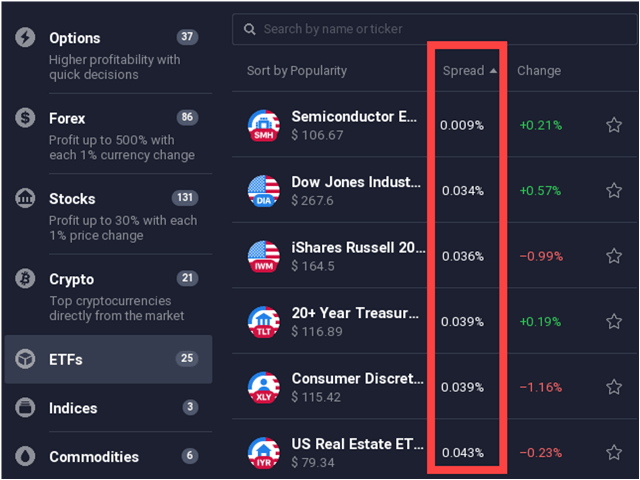 These ETFs cover various market sectors and financial instruments, including metals, semiconductors, energy, futures volatility, utilities, emerging markets, technology, global stock indices, and more. Why Trade ETFs? What are the Advantages? One of the most important advantages of trading ETFs is that traders can gain exposure to a specific market sector or group of assets by means of a single ETF instrument. For example, if a trader believes that a boom might take place in the semiconductor industry, he may take a long position in IQ Option’s VanEck Vectors Semiconductor ETF which tracks the performance results of some of the largest and most liquid U.S. listed companies which are active in the semiconductor industry. Likewise, an investor who would like to gain broad exposure to the technology industry need not purchase many different technology stocks and be troubled with the technicalities of how to ‘weight’ his technology portfolio. By simply buying IQ Option’s Technology Select Sector Fund, the investor can achieve his goal with great convenience and simplicity. 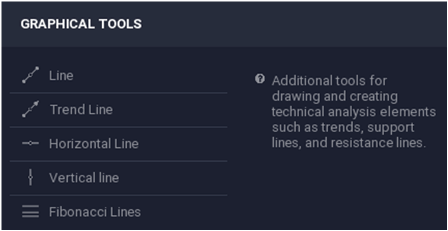 Traders from outside the European Union and pro-EU traders can trade IQ Option’s ETF instruments with leverage of up to 1:100. Retail traders from the European Union (EU) are limited by ESMA (the European Securities and Markets Authority) regulation to a maximum leverage of 1:5. IQ Option’s ETFs are ‘based’ in the United States and the times during which they can be traded are aligned with the market hours of the New York Stock Exchange (NYSE), which are 09:30 EST to 16:00 EST. 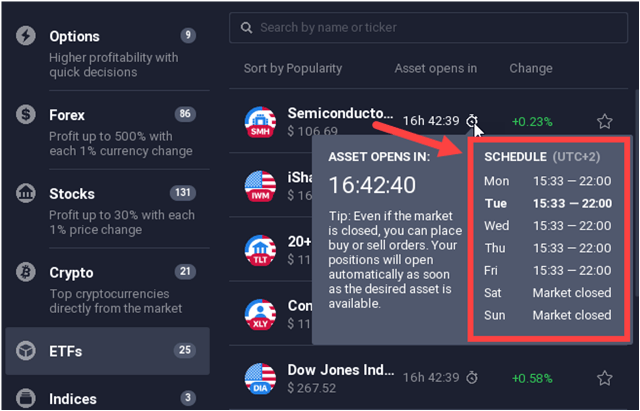 However, most of IQ Option’s ETFs can be traded between 09:33 EST and 16:00 EST, with some being available from 09:30. MOST OF IQ OPTION’S ETFS ARE TRADABLE BETWEEN 09:33 AND 16:00 EST (15:33-22:00 GMT+2). *Please note that daylight saving times may cause differences, depending on your location. As you may know, demo trading comes first, only to be followed by real money trading when consistent results are achieved. 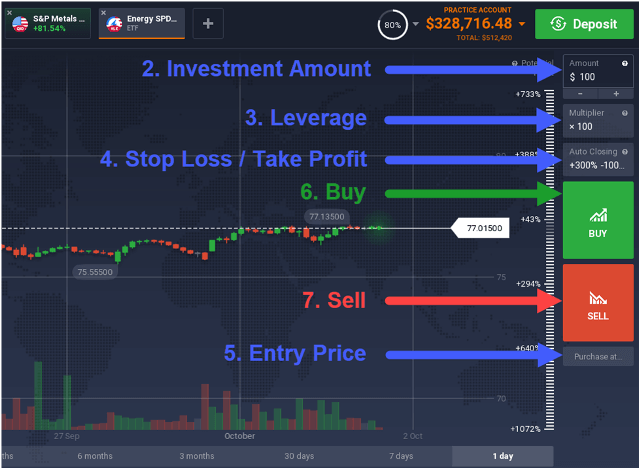 Access to a good demo account is a great advantage, not only for beginners but also for seasoned traders who need to test out a new trading strategy or simply practice a specific skill. 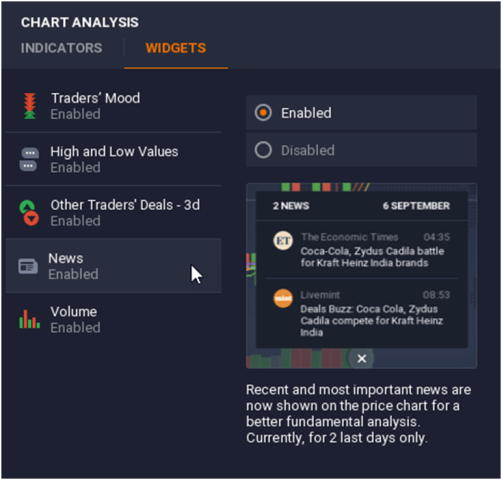 IQ OPTION’S DEMO ACCOUNT IS A GREAT TOOL FOR BOTH BEGINNERS AND EXPERIENCED TRADERS. If you’re looking for instruments to trade with really low spreads, IQ Option’s ETFs could be a great option for you. ETF trades can be conveniently executed on IQ Option’s trading platform with preset stop loss and take profit parameters if desired. Of course, these trade parameters can easily be modified after trade execution. 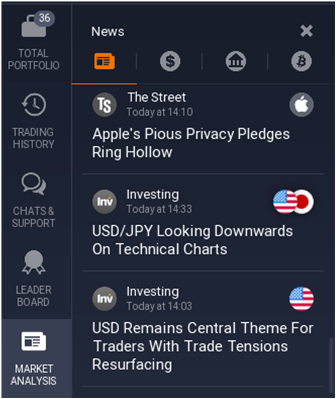 With IQ Option’s multi-asset trading platform, traders who desire broad portfolio diversification can effectively combine ETFs with other assets like forex pairs, stocks, equity indices, commodities, and cryptocurrencies. 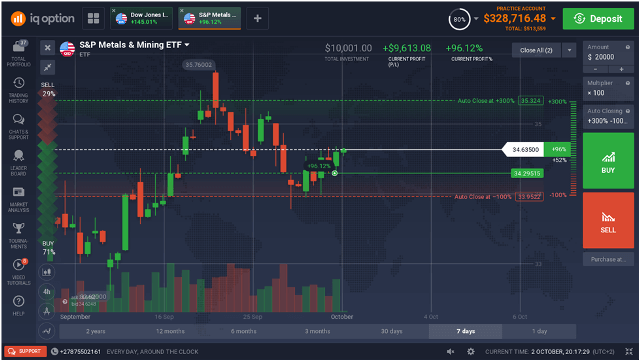 IQ Option’s trading tools, technical indicators, widgets, and other platform features are there to give you a headstart with your ETF trading!